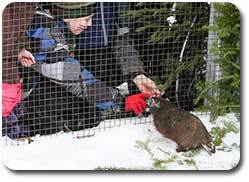 Of all the animals at the Shubenacadie Wildlife Park, none has achieved the attention and fame of Shubenacadie Sam, the Prognosticating Groundhog. February 2nd, Groundhog Day, is an important day all over North America, as according to tradition, the groundhog will poke his head out of his winter burrow to forecast spring. Should the groundhog see his shadow, winter will hang on for another six weeks, but should the groundhog not see his shadow, an early spring is on the way. Groundhogs are rodents, members of the Marmota monax species, one of the very few mammals that truly hibernate during the winter months. 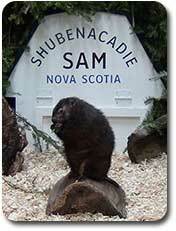 As a Prognosticating Groundhog, Shubenacadie Sam is an exception and while his cousins are asleep, snug in their winter burrow, Sam is busy training for the big day. He is provided with a special groundhog diet that meets all his vegetarian needs plus he has specialized training sessions in yoga and meditation. In these modern times, it is especially important that Sam maintain contact with his broad fan base, so he spends time on Facebook and communicates via Twitter. He is especially fond of social media and has enjoyed his time as the focus of a live webcam broadcast, the SamCam. On Feb 2nd, Sam's day begins early, with fans arriving before dawn in anticipation of his appearance. Television and radio station representatives gather to be the first to share his prediction with the world. Living on the far eastern edge of Canada, Sam is the first groundhog in North America to emerge on Groundhog Day. As a result, he sets the bar for the other Prognosticators across the continent. Just before 8am, a procession makes its way to Sam's enclosure. A bagpiper, town crier and local dignitaries accompany Sam's personal representative who will open the door to Sam's house at precisely 8am and encourage him to emerge. Once out of his house, Sam's prediction is quickly determined and the celebration continues. Sam will spend the morning alternately interacting with his visitors and the media, and resting. Is Sam's prediction accurate? Always. Whether the weather agrees is inconsequential as Sam is always correct in his prediction regarding the arrival of spring. In the summer season, visitors can see Sam in the groundhog enclosure, enjoying the anonymity of blending in with his family members.